Women's Rights Rally in Indonesia! 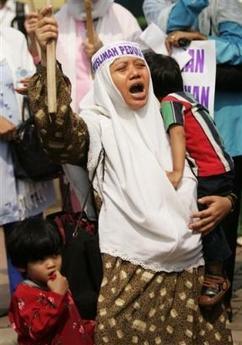 Hundreds of Indonesian women protest in Jakarta calling for the government to take more action to protect women. 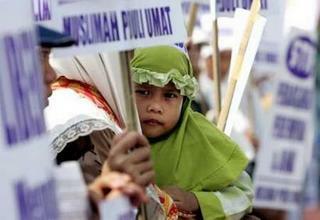 More than 90 percent of the 240,000 domestic workers in Malaysia are Indonesian. The Human Rights Watch report documents how they typically work grueling 16 to 18 hour days, seven days a week, and earn less than U.S. $0.25 per hour. Migrant workers worldwide send over $90 billion to developing countries, exceeding foreign aid. An increasing number of labor migrants are female. 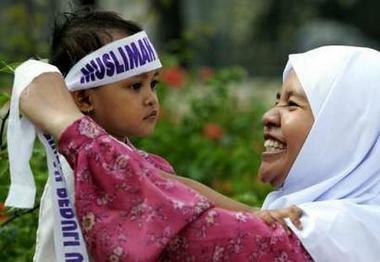 In Indonesia, 76 percent of all legal migrant workers in 2002 were women. Most female migrant workers are concentrated in low-paying, unregulated sectors like domestic work. On December 6, 2000, four workers for an organization called Rehabilitation Action for Torture Victims of Aceh or RATA, were stopped outside Lhokseumawe, North Aceh, and abducted by a group of armed soldiers and civilians. Two men and a woman were executed; a fourth escaped and gave testimony identifying several of the killers. Later that month, four civilians and four military men were arrested. The civilians “escaped”–they were almost certainly let go with official connivance–from a police barracks in Medan, North Sumatra on March 22, 2001. One of them was back in Aceh in June, terrorizing local activists. Indonesia is a country where diplomacy is still seen as a man’s job. There are certain stereotypes for the sexes in this Muslim country that apply to opportunities for women. Women rally against abuse in Jakarta, today. Also, in the Jakarta news today, an Indonesian pilot is going on trial for the murder of a human rights activist from Indonesia who was poisoned on a flight to Amsterdam. Prosecutors believe the activist was poisoned from the orange juice drink he ordered on the flight.